Raising a glass and enjoying locally made cider at Far From the Tree, one of the tasting stops on the new Salem Spirits Trolley. For Karen Scalia, it was a natural extension. 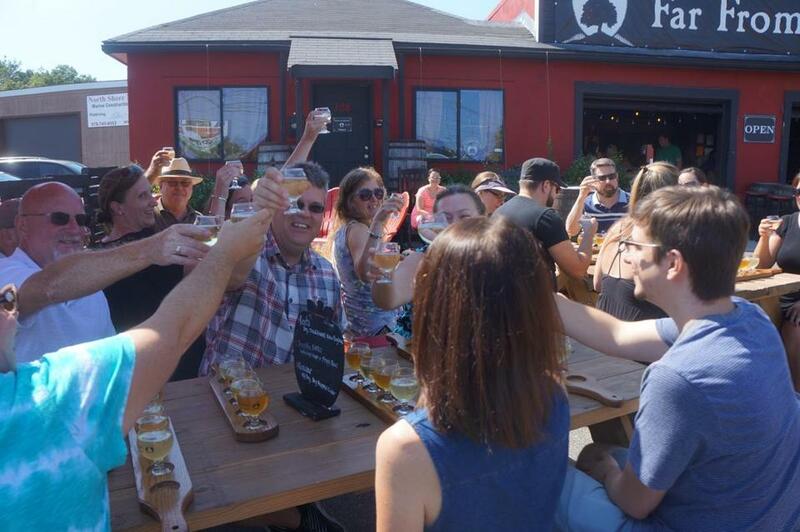 The founder of Salem Food Tours has now launched Salem Spirits Trolley, a three-hour excursion through the city to local destinations that include Deacon Giles Distillery, Notch Brewing, and Far From the Tree Cider. The trolley ride, hosted by her husband, comedian and emcee Mark Scalia, and others, includes historic information, behind-the-scenes tours, and, of course, tastings. We talked with Karen Scalia, 51, of Salem. A. Event and food planning and the performing arts. I founded the Salem Food Tours in 2010. It has been amazing to shine a light on the incredible food scene we have in Salem. A. There are local people making wonderful craft products, but it might be something that gets passed by. This is an opportunity to talk with them about their process and passion, as well as its relevance to the story of Salem. A. Deacon Giles Distillery makes rum and gin using traditional methods. Notch Brewing has low-alcohol, high-flavor, easy-drinking beer. Far From the Tree produces hard cider the old-school way, using 100 percent Massachusetts apples. I wouldn’t be surprised to see more [companies] coming into Salem with the success of these three. A. 1 to 4 p.m. When the tour is done, people can go have dinner and order the [beverages] they tasted. There is a fantastic synergy in town. A. I hope it appeals to the young [must be 21 to participate]. It’s part of their culture and the locally sourced movement, which is exciting. There’s a lot of energy behind craft makers. And older people enjoy it, as well. A. We meet at Pickering Wharf and go on a ride through Salem’s prettiest neighborhoods, from the waterfront to the historic McIntire District. A. Public tours are $40, which includes “sips.” There are also private and corporate tours. A. People can come as a group or meet new friends. It’s educational, entertaining, and fun, and a great way to experience Salem.